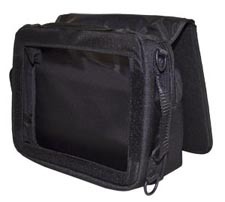 Black Soft Case with Hinged Front Flap. The Flap is held in place by velcro strips and the Bird Logo embroidered on lower left corner of flap. Separated compartment on back of case for manual. Shoulder strap with adjustable length and (2) Hand Straps attached to the side of the case. Includes and Accessory Pouch with zipper on one side for access. Velcro on rear surface of pouch for attachment to the main case.